I'll come right out and say it. I was burnt out. Somewhere along the way, I lost that spark that made me a teacher. There are so many reasons why it happened: The constant battle with the state legislature for adequate funding and fair treatment. The isolating feeling of being the only male teacher in my school. The sudden shift to new standards. So many little things that just made it harder and harder to be enthused about my work. I knew that I wasn't doing my best teaching anymore. I was ashamed. I felt like a failure knowing that my attitude could prevent some of my kids from having the best fifth grade year possible. It seemed as though I had no one to turn to. I was uncomfortable talking to teachers who always seemed to be doing great because I didn't want them to know how I was feeling. If I talked to other teachers who were having a rough year, it became a festival of complaint. All of that just made my burnout worse and worse. In February, a college friend of mine mentioned how much he enjoyed his state edchat. I had a Twitter account I never used, so I thought I would check things out. In a few minutes I discovered an upcoming Google Apps for Education Festival in my area. I secured a last-minute registration for the GAfE Festival, knowing that I needed something to inspire me. I gained some new ideas from the sessions at the festival, but the most valuable experience came after the event. The organizers invited everyone to meet later that night at a local pub for an after-party. That night, I connected with teachers throughout the West who were doing amazing things. In addition, they talked about how much they learn from Twitter. Later that week, I made sure to participate in #IDedchat on Twitter. The topic was ideas for successfully implementing the Common Core Standards. I shared a few things that I had done, but mostly I learned that teachers from all over the state were coming up with ideas to implement the new standards even though they were struggling with the same problems of little training and insufficient materials that I was facing. Over the next few weeks, I continued to participate with #IDedchat, but I also dropped in on #MTedchat, #NorCalChat, #SlowChatEd, #WyoEdChat, #nt2t and #WeirdEd. With each edchat, I met more teachers who were finding success in the face of obstacles and added them to my personal learning network. I never mentioned my burnout to my PLN. It was my secret shame. But as I connected with more and more teachers, my enthusiasm and passion for teaching rekindled. I was trying new ideas like MysterySkype and Genius Hour with my students. I began sharing what I learned on Twitter and at the GAfE festival with my colleagues at school. Soon, new opportunities came my way: I was asked to be my building technology leader (an extra duty I had wanted for a long time), my principal approached me about teaching our school's advanced learning program for the coming year, I got to lead a session at EdCamp Spokane, and I facilitated a summer book study on Google+. In addition, I started blogging about my own experience as a teacher and even wrote a guest post for a summer Blog-a-thon. It was easy to forget that I had ever faced burnout. My flame for teaching is burning the brightest it ever has! So, why bother sharing my story of burnout? Teaching is a tough job, and when someone faces the type of stress that comes with the job, burnout is always possible. Burnout carries such a stigma that I felt terribly ashamed for reaching that point. I was scared of how my colleagues in my own system would react if I admitted how much I was struggling. Yet, it was only after I connected with other teachers that I was able to overcome burnout. As teachers, we need to break the stigma associated with burnout and connect with our colleagues. I'm thankful that I found Twitter and some great professional development to light my fire, but the key was connecting with other educators and learning new ideas. We can do this in our own schools and districts. Please, reach out to the other teachers around you, especially those who are having a rough year. Be a sympathetic listener as they share struggles and ideas. You might be the light that rekindles a flame! I really can connect to this. I had some tough times this year as well. Just because people aren't talking/tweeting about their struggles doesn't mean they don't happen. But keeping it inside just leads to more frustration and isolation. Definitely had my share of disappointments this spring. I had a Twitter account for over a year as well but somehow happened to reconnect this March. Shortly after I came across a bunch of educators praising the book, "Teach Like a Pirate." Between buying and reading the book as well as lurking and then participating in #IAedchat (& since then many others), I felt a whole new sense of inspiration. And I haven't looked back. I'm more excited for this next year than I have been in many years. I think I'll be celebrating my 20th year in education in some great ways. Good to hear you've had more doors open for you as your connections have grown. Part of it is just the renewed sense of confidence that you're doing the right thing and not alone, right? If someone told ME that I would be writing a blog, I'd laugh and say no way. P.S. You have an artist in your family! Great pic! I rarely see anyone mention their struggles on Twitter, and I think that is part of why it inspires. There is so much more positive than negative in what I see there. By and large, when people talk about struggles on Twitter, they are looking for solutions rather than wallowing in the problem. I noticed all of the praise for Teach Like a PIRATE when I joined Twitter, too. I'm in the middle of reading it (and helping with the #IDedchat book study of it) right now. It is very inspiring and I can't wait to use my new ideas from it. Thanks so much for the comment. And I'm with you - I never thought I'd be blogging, especially about "behind the curtain" teacher struggles. I'm hoping to talk Sarah into doing more illustration for my blog. 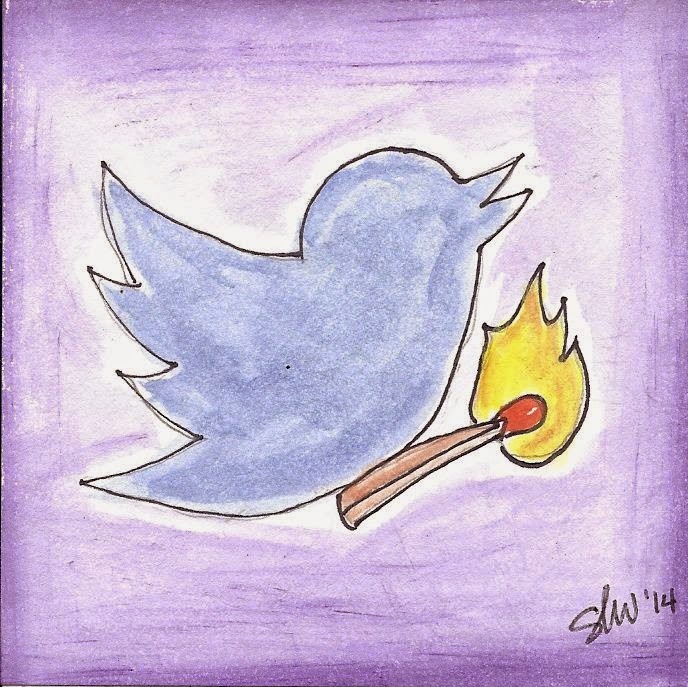 She did the Twitter birdie with match in pen and watercolors. The scan doesn't entirely do it justice. Not only is she a terrific artist, wife, and mother, she is an elementary music teacher & tech coach. Love that you're sharing - too many people hide behind their burn-out because of feeling inadequate, when together we are so much more. I know that I've spent days in tears, years where I felt less adequate, but I agree - being connected to new ideas, new inspirations, new possibilities can change that. I look forward to reading more about your journey. Glad you're a part of my PLN. Thanks for the comment and being part of my PLN, too! I've had rough spots before, but I got to the point last year where I really wondered if I had picked the right career. Connecting with others turned that all around! I'm inspired by my colleagues every day now. It is truly amazing! I hear what you are saying! It wasn't until I became active on Twitter and was finding so many amazing leaders/teachers did I realize what I was missing. The educator energy on Twitter is truly amazing! I will always be an advocate for building a PLN this way. Yes! I'm encouraging others to build their PLN all the time now. Thanks for finding me and reading my reflections! I echo the sentiments expressed by the other fabulous members of our PLN above. I have found that many of us discovered that the magic of Twitter altered the downward trajectory of our possible teacher burnout. I, too, felt like I was alone in my thinking and found the camaraderie I so needed through my Twitter PLN. Although it will be difficult, I want to reach out more to my "in person" PLN at my school and hopefully get them on board with the many exciting ideas I want to try next year. Keep up the good fight! These are great stories! I am brand new to the power of Twitter and I can't wait to hopefully pass it on to the staff at my school. It is truly inspirational. Thanks for sharing your story, Jim. I may put it in my arsenal for PD. Have a great 14-15 year!